According to the recent News, Canada Immigration Minister Ahmed Hussen has stated that Canada will welcome nearly one million immigrants over the next three years. He further adds, "Our government believes that newcomers play a vital role in our society. Five million Canadians are set to retire by 2035 and we have fewer people working to support seniors and retirees." The above statement is a clear indication of the Canadian Govt.’s strategy to provide Canadian Citizenship to newcomers under various economic programs to address skills shortages and gaps in the labour market. 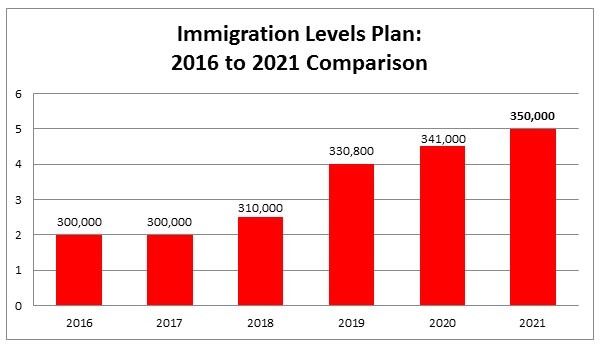 In total, the plan targets 1,021,800 new immigrants to Canada. The Immigration Minister has cleared the real motivation behind the need for workforce was to nurture the business and nourish the Canadian economy. “In certain regions the hunger for workers is huge,” he said. The higher increase to Canada’s immigration numbers was once demanded by many immigration pundits and economic groups. Even the government’s own economic advisory council had recommended to invite around 450,000 people in 2016. But the Canadian Government’s approach is more calculative and measured keeping in mind with the need to ensure complete access of suitable settlement services to newcomers. According to the touted plan, The Federal High Skilled category will hike to 88,800 in 2021, on the account of new immigrants coming to Canada through the Express Entry System. Federal Skilled Worker Program – The program targets the skilled workforce with required education and experience in-line with the Canadian requirements. Furthermore, the Provincial Nominee Program allocation will also reach to 71,300 in 2021. This will indicate the rapid surge of more than 10,000 immigrants between 2019 and 2021 for the Provincial Nominee Programs. In 2019, the new plan permits 88,500 newcomers in the Family Class, compared to 86,000 under the 2018 plan. This will increase to 91,000 in 2020, and remain the same in 2021. Come and join the bandwagon with Abhinav to become One of the nearly 1 Million New Immigrants relocating to Canada!